Background Bile acid diarrhoea (BAD) is a common cause of chronic diarrhoea with a population prevalence of primary BAD around 1%. Previous studies have identified associations with low levels of the ileal hormone fibroblast growth factor 19 (FGF19), obesity and hypertriglyceridaemia. The aim of this study was to identify further associations of BAD. Methods A cohort of patients with chronic diarrhoea who underwent 75selenohomocholic acid taurate (SeHCAT) testing for BAD was further analysed retrospectively. Additional clinical details available from the electronic patient record, including imaging, colonoscopy, chemistry and histopathology reports were used to calculate the prevalence of fatty liver disease, gallstones, colonic neoplasia and microscopic colitis, which was compared for BAD, the primary BAD subset and control patients with diarrhoea. Findings Of 578 patients, 303 (52%) had BAD, defined as a SeHCAT 7d retention value <15%, with 179 (31%) having primary BAD. 425 had an alanine aminotransferase (ALT) recorded, 184 had liver imaging and 176 had both. Overall, SeHCAT values were negatively associated with ALT (rs=−0.19, p<0.0001). Patients with BAD had an OR of 3.1 for an ALT >31 ng/mL with imaging showing fatty liver (p<0.001); similar figures occurred in the primary BAD group. FGF19 was not significantly related to fatty liver but low levels were predictive of ALT >40 IU/L. In 176 subjects with gallbladder imaging, 27% had gallstones, 7% had a prior cholecystectomy and 34% either of these. The median SeHCAT values were lower in those with gallstones (3.8%, p<0.0001), or gallstones/cholecystectomy (7.2%, p<0.001), compared with normal gallbladder imaging (14%). Overall, BAD had an OR of 2.0 for gallstones/cholecystectomy (p<0.05). BAD was not significantly associated with colonic adenoma/carcinoma or with microscopic colitis. Interpretation The diagnosis of BAD is associated with fatty liver disease and with gallstones. The reasons for these associations require further investigation into potential metabolic causes. Bile acid diarrhoea is a common but under-recognised cause of chronic diarrhoea, which can be diagnosed by the 75selenohomocholic acid taurate (SeHCAT) test. Primary bile acid diarrhoea may result from impaired regulation of hepatic bile acid synthesis by the hormone fibroblast growth factor 19, which also has other metabolic actions. The conditions associated with the causes and effects of bile acid diarrhoea are poorly understood. A cohort of patients who all had SeHCAT testing to diagnose bile acid diarrhoea was further analysed to investigate specific associated conditions. Markers for fatty liver disease were found more commonly in patients with bile acid diarrhoea. The presence of gallstones, or a previous cholecystectomy, was associated with bile acid diarrhoea. Colonic polyps, cancer and microscopic colitis were not commoner in bile acid diarrhoea. The association of bile acid diarrhoea with fatty liver and with gallstones suggests there are shared pathways, and further study may help in the understanding of these conditions. Furthermore, a common genetic variant of FXR is associated with low FGF19 and gallstones.11 Cholecystectomy has long been known to be a risk factor for BAD, but the mechanism of this remains unknown. However, the connection between these conditions and FGF19 is yet to be fully characterised. When considering conditions that may be associated with BAD, there are those that that may be linked by a shared pathogenesis in low FGF19, as already described, but there are others that may be caused by BAD by increased BA exposure in the colon. Microscopic colitis produces diarrhoea, which is indistinguishable from BAD symptomatically. Budesonide, in controlled release formulation, has been shown to reduce diarrhoea and increase SeHCAT retention, raising the possibility that, in a subset of patients at least, BAD is the mechanism of diarrhoea in microscopic colitis.12 At high concentrations, BAs can be mutagenic and increased faecal BAs have been reported in patients with colorectal cancer and adenomas.13 Theoretically, the increased concentration of BAs in the colon as a consequence of BAD could be a risk factor for colorectal carcinoma (CRC) and adenomas. From these findings, we hypothesised that BAD could commonly coexist with conditions such as hypertriglyceridaemia, NAFLD and gallstones which may share pathophysiological mechanisms. In addition, we also hypothesised that there would be an increased incidence of microscopic colitis and colorectal adenomas in patients with a SeHCAT retention of <15%. Using the cohort of patients with chronic diarrhoea that we have assembled, who have all undergone SeHCAT testing for diagnosis of BAD, we looked for associations between these disorders, by comparing the prevalence in patients with and without BAD. Results for patients undergoing SeHCAT tests to investigate symptoms of chronic diarrhoea at Imperial Healthcare NHS Trust have been collected prospectively since 2009. Patients who had a SeHCAT test elsewhere and were referred for specialist care were also added to the database, as were patients who had SeHCAT tests before this time but were under follow-up in our clinic during this period. A SeHCAT 7-day retention of <15% was taken as diagnostic as BAD. Many of these patients have been included in previous reports.14 15 We have performed a further retrospective analysis to look for specific associated conditions. Patients with a SeHCAT <15% were categorised as type 1, 2, 3 BAD. This was performed both at the time of addition to the database and retrospectively at the time of study analysis by examination of outpatient clinic letters, clinical imaging, endoscopy and histology reports during the period 2009–2014. Letters and reports that quoted findings that predated this period were also included. Patients with terminal ileal resection or ileal Crohn’s disease were recorded as type 1. The presence of any other gastrointestinal disease or surgery distal to the pylorus, including cholecystectomy was recorded at type 3. Patients with no evidence of another gastrointestinal disease were categorised as type 2 PBAD. Clinical information was searched for on a variety of hospital clinical systems using the patient’s unique hospital number. Information of significant comorbidities, including liver disease, was also reviewed from the available information; patients were excluded if another liver disease such as cirrhosis had been diagnosed. The following information was obtained from the electronic patient record systems: clinical biochemistry (only the samples from the nearest date to the SeHCAT test within 6 months were used), alanine aminotransferase (ALT, IU/L), triglycerides (TG, mmol/L); clinical imaging (at any time), presence of fatty liver on ultrasound, MRI or CT scan, presence of gallstones or a cholecystectomy on ultrasound, MRI or CT scan (patients with no available imaging but known to have a cholecystectomy, were also included); total number of polyps (for all colonoscopies reported), size of largest polyp, presence of colorectal cancer (or reporting of a previous resected cancer), histology (specimens taken at any time). Non-parametric tests were used predominantly as the data were not normally distributed. Continuous data were compared with SeHCAT 7-day retention value using Spearman’s rank correlation. Median SeHCAT values were described for categorical data. ORs and CIs for each disease were calculated for SeHCAT <15% and analysed using Fisher’s exact test. Groups were compared for significant associations using Kruskal-Wallis and Mann-Whitney U tests. A p value of <0.05 was deemed as significant and was adjusted by Bonferroni correction, where multiple comparisons were made. All statistical analysis was performed using Prism V.6 software (GraphPad Software, La Jolla, California, USA). A total of 578 patients with chronic diarrhoea and SeHCAT values were included; 303 (52%) had positive results with a value <15%, defining BAD. Of these, 179 (31%) patients had PBAD and 124 (21%) had SBAD. The remaining 275 with SeHCAT >15% were controls; 126 patients had serum FGF19 measured as part of previous studies. The ethnicity of our patients, where this had been recorded, was 74% Caucasian, 15% Asian, 5% African-Caribbean and 6% mixed. Other demographics are shown in table 1. Four hundred and twenty-five patients had an ALT recorded, 184 had liver imaging and 176 had both. SeHCAT values correlated negatively with ALT (rs=−0.19, p<0.0001) . Median values (and IQR) of ALT for groups with SeHCAT >15%, 10%–15%, 5%–10% and 0%–5% were 22 (16–30), 26 (18–36), 27 (20–40) and 26 (18–43), p=0.008, Kruskal-Wallis test. Comparing the groups with and without any form of BAD, a SeHCAT value <15% was associated with an ALT >31 IU/L (36% vs 21%, p<0.001), OR 1.72 (95% CI 1.14 to 2.61, p=0.01) and also with imaging showing steatosis together with ALT >31 IU/L (21% vs 7%, p<0.05), OR 3.05 (95% CI 1.1 to 8.45, p<0.05) (Figure 1). (A) Proportion of patients displayed by 75selenohomocholic acid taurate (SeHCAT) positivity (<15%) with imaging reporting hepatic steatosis (imaging), ALT > 31 IU/L or both steatosis on imaging and ALT >31 IU/L (both). (B) Proportion of patients displayed by BAD type and controls (SeHCAT >15%) with imaging reporting hepatic steatosis (imaging), ALT > 31 IU/L or both steatosis and ALT >31 IU/L (both). (C) OR (95% CI) of SeHCAT <15% (BAD) or primary BAD (PBAD) and ALT >31 IU/L, or imaging of hepatic steatosis and ALT > 31 IU/L (both). (D) Correlation of SeHCAT 7-day retention (%) with ALT (IU/L), with linear regression fit line shown, rs=Spearman’s rank correlation. *p<0.05, **p<0.01, ***p<0.001, ****p<0.0001. Looking specifically at the PBAD subgroup, 128 of these patients had an ALT recorded and 57 had imaging. With types 1 and 3 (secondary) BAD excluded, SeHCAT value correlated negatively with ALT (rs=−0.23, p<0.0001). 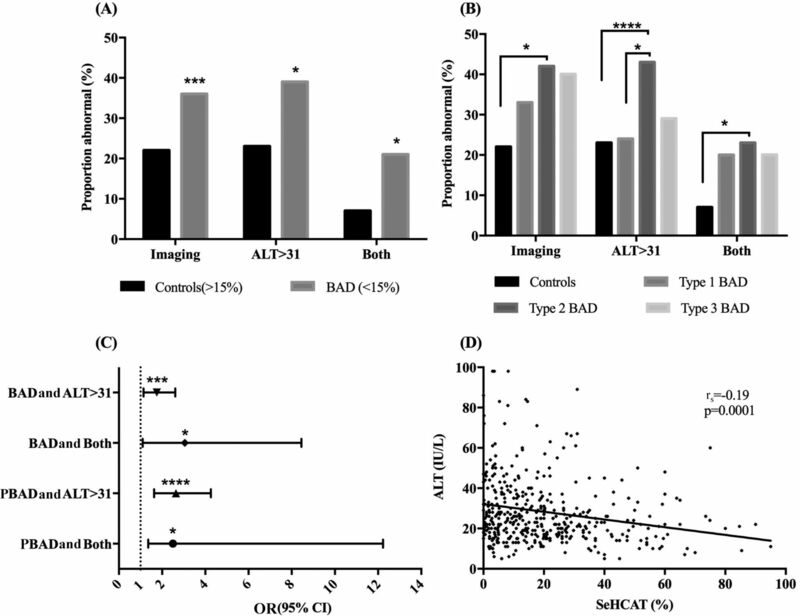 PBAD was associated with ALT >31 IU/L (43% vs 21%, p<0.001), OR of 2.64 (95% CI 1.63 to 4.26, p<0.001) and positive imaging together with ALT >31 IU/L (23% vs 7%, p<0.05), OR 2.5 (95% CI 1.36 to 12.23, p<0.05). One hundred and twenty-three patients had both fasting FGF19 and ALT recorded, no significant correlation was found (rs=−0.08, p=0.2). However, FGF19 <70 pg/mL (n=10) was predictive of an ALT >40 IU/mL (40% vs 12%, p<0.05), OR 5.13 (95% CI 1.28 to 20.61, p<0.05). One hundred and eighty-three patients had imaging that reported on the gallbladder, of which nine showed the presence of polyps. These were excluded, leaving 176 for further analysis. Of these, 103 (59%) had a positive SeHCAT scan <15%, 47 (27%) had gallstones, 12 (7%) had a cholecystectomy, so that 59 (34%) had either gallstones or cholecystectomy. There was no significant difference in the rate of gallstones or cholecystectomy by gender (64% vs 72%, p=0.2), but mean age in the gallstones/cholecystectomy group was higher (50 vs 57 years, p<0.005). The median SeHCAT for those with gallstones or cholecystectomy was significantly lower than those without (7.2% vs 14%, p<0.001). With cholecystectomy excluded, the median SeHCAT was still lower for those with gallstones (3.8% vs 14%, p<0.0001). Overall, a SeHCAT value of <15% was associated with an increased risk of gallstones or cholecystectomy (OR 2.0, 95% CI 1.04 to 3.92, p<0.05, figure 2) and the presence of PBAD was associated with gallstones, although this did not reach statistical significance (OR 1.98, 95% CI 0.65 to 5.99, p=0.23). (A) Proportion of patients displayed by 75selenohomocholic acid taurate (SeHCAT) 7-day retention value with cholecystectomy (CCX), gallstones (with cholecystectomy excluded (GS)) or cholecystectomy and gallstones combined (CCX+GS). (B) ORs (95% CI) of SeHCAT <15% with CCX, GS or CCX+GS. ns, non-significant, *p<0.05, **p<0.01, ***p<0.001. Two hundred and thirty-nine patients had serum TG measured. An analysis of 106 of them has been performed before.15PBAD was significantly associated with a higher TG (mean 1.87 (95% CI 1.58 to 2.16) vs 1.29 (1.12 to 1.47) mmol/L, p<0.001). The ORs for patient with a positive SeHCAT having a TG > 1.7 or >2.4 mmol/L were 3.3 (p<0.001) and 3.1 (p<0.01), respectively (figure 3). Two hundred and nine patients had low-density lipoprotein recorded, and this correlated positively with SeHCAT, rs=0.14, p<0.05. Correlation of 75selenohomocholic acid taurate (SeHCAT) 7-day retention (%) with low-density lipoprotein (LDL) cholesterol (A) and triglycerides (TG) (B) with linear regression fit line shown, rs=Spearman’s rank correlation. (C) OR (95% CI) of SeHCAT <15% (bile acid diarrhoea (BAD)) and TG >1.7 or >2.4 mmol/L. (D) Median TG (IQR) of patients with SeHCAT > 15% (controls) and displayed by BAD type and compared with controls. ns, non-significant, *p<0.05, **p<0.01, ***p<0.001, ****p<0.0001. One hundred and four patients had ALT, TG and gallbladder imaging recorded. Sixty-three of these patients had a SeHCAT <15% and 41>15%. 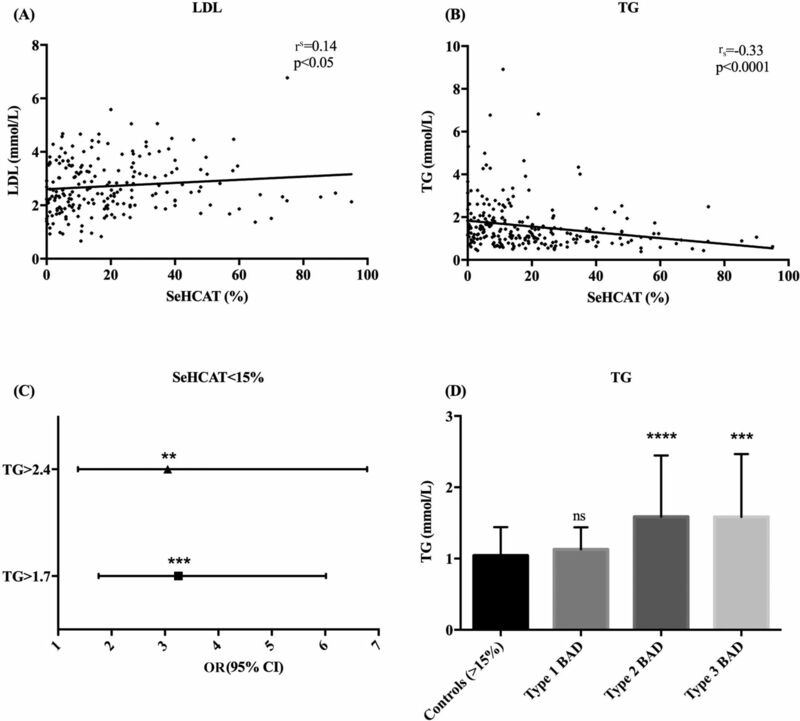 The OR of transaminasaemia, hypertriglyceridaemia and gallstones occurring together in patients with BAD compared with controls with a SeHCAT >15% was 2.7 (95% CI 0.29 to 25.01). The Fisher’s exact test was p=0.65 (non-significant). Three hundred and twenty-eight patients without inflammatory bowel disease (IBD) had a completed colonoscopy, of which 172 had a SeHCAT <15% and 156 had a SeHCAT >15%. The SeHCAT 7-day value did not correlate with number of polyps, the number of polyps >1 cm or the number with colorectal cancer. Demographics of this cohort and incidence of colonic adenomas or cancer by SeHCAT result are shown in table 2. Two hundred patients had colonic biopsies, and 74 had ileal biopsies. Thirty-two patients were previously excluded due to the presence of IBD. One hundred one patients had a SeHCAT > 15% and four of these had histology positive for microscopic colitis. Ninety-nine patients had a SeHCAT diagnostic of BAD (<15%) and five of these were positive for microscopic colitis. Therefore, there was no significant difference in the incidence of microscopic colitis in patients with SeHCAT <15%. In view of possible shared pathophysiological mechanisms, we hypothesised that BAD (in particular PBAD), hypertriglyceridaemia, NAFLD and gallstones could be associated. Here, we report that BAD, as defined by SeHCAT testing, does more commonly coexist with hepatic steatosis (as suggested by a raised ALT and liver imaging (OR 3.0)), hypertriglyceridaemia (OR 3.3) and gallstones or cholecystectomy (OR 2.0). The rationale for NAFLD being associated with BAD comes from the known association of both these diseases with hypertriglyceridaemia and obesity. In our previous publication including many of the patients in the current study,14 we found that overall SeHCAT and body mass index (BMI) values showed a significant, negative association (rs=−0.21, p=0.02). Obesity is clearly a plausible confounding factor in this present study; in 106 patients with available BMI data, there is an association of BMI and ALT (rs=0.15), which is of borderline significance (p=0.07). It would be of interest to perform an analysis on a larger series having sufficient power to determine the possible causal relationships contributing to these associated disorders. It is plausible that a reduced FGF19 is a pathogenic factor in both diseases as well, since it is associated with obesity, hepatic insulin resistance and NAFLD in paediatric patients.9 That study also reported a significant negative correlation between FGF19 and ALT, similar to our reported negative correlation of SeHCAT value and ALT, suggesting that the role of FGF19 could be of importance.9 Another recent study, also in paediatric patients, also showed low serum FGF19 in patients with non-alcoholic steatohepatitis (NASH) and raised levels of serum BAs, which were linked to differences in the gut microbiome.16 It is of interest to note that both PBAD and NASH respond to the FXR agonist, obeticholic acid, which stimulates FGF19.17 18 We did not find an association of FGF19 with ALT using the 30 IU/L cut-off, but only at a higher value of > 40 IU/L, with an FGF19 value of <70 pg/mL. There are multiple factors affecting FGF19 signalling, and some of these will affect the hepatic response to circulating levels FGF19, as has been shown previously.10 A prospective study, currently in progress, will help define these further. The mechanism of higher serum TG in patients with BAD is seemingly paradoxical, since in a large population study, TGs were unaffected by FGF19.8 In the same patient group as the current study, we have recently described a positive correlation with SeHCAT and TG, but a negative correlation with FGF19 and TG.15 Furthermore, 30% of patients with a SeHCAT <15% had a high FGF19 and high TG. It appears there are likely to be several different causes of PBAD, including low fasting and stimulated FGF19, and hepatic resistance, suggesting the disease associations are likely to vary according to the underlying pathogenesis. The finding that median SeHCAT values are lower in patients with gallstones, who have not had a cholecystectomy, is intriguing as the mechanism behind postcholecystectomy diarrhoea is not understood. It is associated with increased 7α-OH-4-cholesten-3-one (C4), indicating that increased BA production is a factor, but FGF19 does not change significantly postcholecystectomy.19 Our data suggest that patients with BAD are predisposed to gallstone disease, and probably subsequent cholecystectomy. Suppressing serum FGF19 with BA sequestrants has much larger effect on serum C4 in healthy volunteers, with an 87% reduction in serum FGF19 creating an 18-fold increase in C4.20 It is possible that in susceptible individuals with a reduced SeHCAT retention, the small decrease in FGF19 caused by cholecystectomy, creates a much larger increase in BA production, causing BAD. Equally, it is possible that these patients had diarrhoea predating their cholecystectomy. There were a number of limitations placed on this study due to its retrospective design. In particular, we cannot be certain that the patients presented here as having NAFLD do not have another cause of their raised ALT or steatosis. Alcohol consumption, comprehensive viral hepatitis serology and liver biopsy results were not routinely collected, although patients were excluded if a liver disease other than NAFLD had been diagnosed on the documentation reviewed. Ideally, a diagnosis of NAFLD would be by hepatic biopsy, or at least a validated non-invasive scoring system. We were limited to using ALT and imaging findings, as these are common tests that significant number of our patients had recorded. Ultrasound has sensitivity of 77%–100% depending on the degree of steatosis, and ALT can be normal in up to 23% of patients with biopsy-proven NAFLD.22 23 However, ALT is widely accepted as a marker of severity for NAFLD and regardless of the aetiology of the liver disease, the incidence was found to be higher in patients with BAD. It is also important to remember that our control patients also have chronic diarrhoea and are not healthy volunteers, and so there is likely to be an increased level of comorbidity in this group compared with the general population. In conclusion, we have shown that BAD, and particularly PBAD, is associated with increased incidence of NAFLD, hypertriglyceridaemia and gallstones. The reason for these associations cannot be assumed to be due to low FGF19 alone; however, the BA/FXR/FGF19 pathway is central to all these conditions and merits further prospective study. There is great interest at present in the use of FXR agonists in the treatment of PBC and NASH and there are considerable implications for how this pharmacotherapy may affect the production, intestinal delivery and enterohepatic circulation of BAs, and how these will then change metabolism, the microbiome and functional bowel symptoms.
. Effect of cholecystectomy on bile acid synthesis and circulating levels of fibroblast growth factor 19. Ann Hepatol 2015;14:710–21. Contributors RNA and JRFW devised the study, collected and analysed the data and drafted the manuscript. JDN, IMJ, SSP and JF collected data, contributed to the analysis and to the critical revision of the manuscript. Funding The study was sponsored by Imperial College London. JRFW has served as a speaker, a consultant and an advisory board member for Albireo AB, GE Healthcare, Intercept Pharmaceuticals and Pendopharm. RNA has been supported by research funding from Albireo and Intercept. SSP, IMJ and JDN were supported by the BROAD research fund and/or by BRET. JF has no relevant disclosures. Disclaimer This manuscript has been written in compliance with the STROBE guidance for cohort studies without any exception. Data sharing statement Inquiries regarding access to the data should be addressed to the corresponding author.